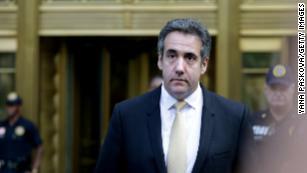 President Donald Trump spoke with Michael Cohen more extensively about the proposed Trump Tower project in Moscow than Cohen previously told Congress, Cohen admitted in federal court Thursday. Cohen had previously said talks about the Moscow project had ended in January 2016 just prior to the Iowa caucuses. Cohen waived his right to an indictment when he appeared in a New York federal court. In truth and in fact, and as Cohen well knew, Cohen’s representations about the Moscow Project he made to (House and Senate intelligence committees) were false and misleading,” Mueller’s office said in a court filing. “Cohen made the false statements to … give the false impression that the Moscow Project ended before ‘the Iowa caucus and….the very first primary,’ in hopes of limiting the ongoing Russia investigations,” the filing adds. “He’s a weak person,” Trump said before departing for Buenos Aires, Argentina. “He was convicted with a fairly long-term sentence with things unrelated to the Trump Organization,” Trump said, citing Cohen’s legal issues with mortgages and the IRS. Meanwhile, it hasn’t been a good day for for the only bank that, by one of them coincidence thingees, has continued to Donald Trump money ever since he crapped out back in 1993, and which by another amazing coincidence was recently fined a nifty $10 billion for various forms of financial misbehavior, including laundering enormous amounts of Russian mob money. I sense a pattern here.
. . . also too, Deutsche Bank gave Trump more than a billion dollars in real estate loans while Anthony Kennedy’s son was the head of a real estate division there.